Broadmeadows Hospital patient, Keith Vandome, was diagnosed with type 1 diabetes when he was just 7 years old. Today, he is 78, manages his condition very well, exercises regularly and with the help of new diabetes technology, he hopes to see the usual day to day blood glucose monitoring become easier. “The insulin choices and treatments at the time I was diagnosed were nothing like today. I’ve seen a lot of changes over the years, and the management of the condition got much better,” Keith said. 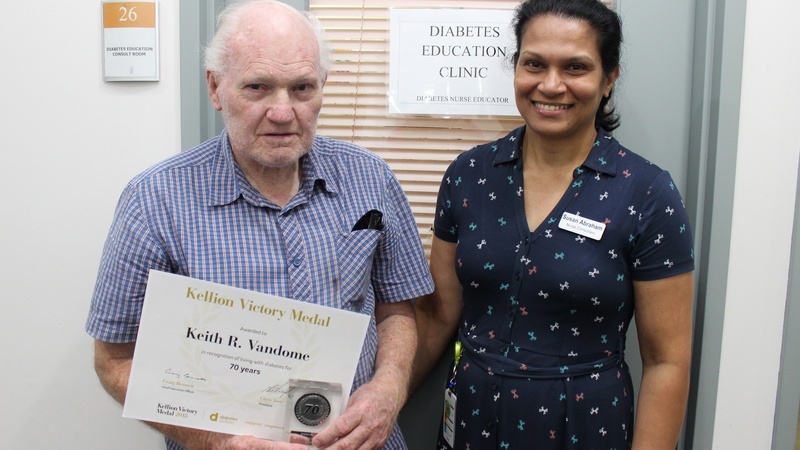 Last year, Keith received the 70th Kellion Victory Medal through Diabetes Australia, for recognition of living with diabetes for more than 70 years. These medals are awarded every year to patients living with diabetes type 1 or 2 for more than 50 years. Keith has been seeing the diabetes educators and dietitian at Broadmeadows Hospital since 2008, and attends The Northern Hospital every 4 months to see the Endocrinologists. At his recent visit in January 2019, Keith was put on the Libre Flash Glucose monitoring system. The Libre Flash Glucose monitoring system is a new diabetes technology approved by the FDA in 2017, which requires the user to “scan” the sensor to obtain current glucose readings and replaces the need to prick the person’s fingers constantly. Diabetes Educator, Susan Abraham, explained the scanning process. “The sensor is placed on the back of the patient’s arm, and the patient obtains their glucose reading by scanning over it. Patients are finding this very helpful as the sensor not only eliminates the need for finger pricking, but also shows data in a form of a graph, indicating glucose levels for the last 24 hours,” she said. Keith is looking forward to easier monitoring and said the secret to living with diabetes for so long is doing the right things and being open to new technologies. “I listen to doctor’s advice, eat healthy, and regularly go to the gym,” he said. At the age of ten, Keith heard a school teacher reading a newspaper article, saying the cure for diabetes is on the way. He still hopes that day will come soon.